Columbia University has awarded the 2018 Naomi Berrie Award for Outstanding Achievement in Diabetes Research to David M. Nathan, MD, Professor of Medicine at the Harvard Medical School and Director of the Diabetes Center at Massachusetts General Hospital in Boston, Massachusetts. Dr. Nathan, who literally wrote the definition of diabetes for the encyclopedia, is an expert on the history, epidemiology and mechanisms of diabetic complications in patients with type 1 diabetes (T1D) and type 2 diabetes (T2D). 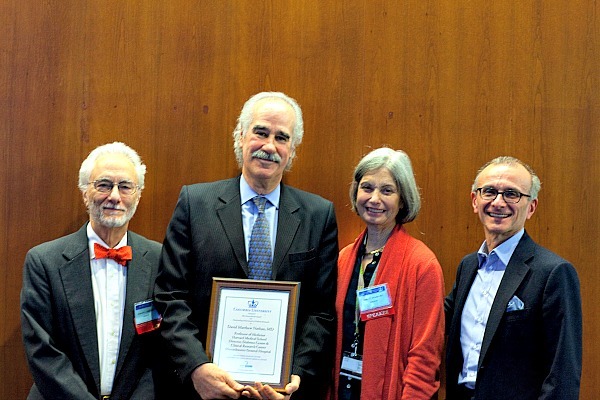 The award was presented to Dr. Nathan during the 20thAnnual Frontiers in Diabetes Research Symposium held November 17, in a ceremony at the Russ Berrie Medical Science Pavilion at Columbia University Irving Medical Center (CUIMC). The Naomi Berrie Award for Outstanding Achievement is Columbia University’s top honor for excellence in diabetes research. Dr. Nathan is the 20th winner since the award’s inception in 1999. A goal of this year’s Diabetes Research symposium was to convene students, scientists, clinicians and other stakeholders to examine the latest insights regarding the biological bases for medical complications that affect patients with diabetes, and novel therapeutic approaches to these disorders. Specifically, while persistent hyperglycemia may cause microvascular (retinopathy, nephropathy and neuropathy) disease, knowledge of specific mechanisms is likely to enable more effective therapies to prevent significant morbidity. Further, a direct link between excess glucose per se and cardiovascular and liver disease is far less certain, implying that other comorbid metabolic abnormalities such as hyperinsulinemia/insulin resistance and dyslipidemia may contribute to these associated disorders. Avoiding diabetes-related complications remains the greatest therapeutic challenge—and one that is being met by Berrie Center investigators. Dr. Dieter Egli discussed the efficient generation of insulin-producing cells from a patient’s own skin cells. And Dr. Domenico Accili proposed the use of FoxO inhibitors (termed “Foxins”) to generate insulin-producing cells in the intestine, which may render a predicted immune attack in type 1 diabetes superfluous due to the short half-lives of these cells. Both therapeutic approaches have potential application in patients with type 2 diabetes as well.